The Warwick War Memorial stands in Church Street, between The Collegiate Church of St. Mary and the Court House/Town Hall. It is at the entrance to the medieval alley called The Tink-a-Tank that runs through the churchyard to The Butts. 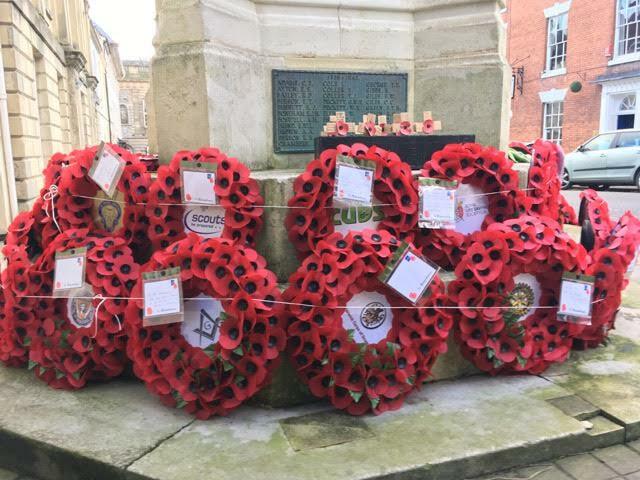 During World War I, the names of those killed were written on large wooden plaques and attached to the railings of St. Mary’s churchyard in Church Street. After the war, a committee was formed to decide on a permanent tribute. It is a striking example of an Eleanor Cross memorial. It is 36 feet (11 meters) tall. Constructed in Portland Stone by the Birmingham Guild foundry and Bridgeman and Co builders of Lichfield, it is in good condition to this day. 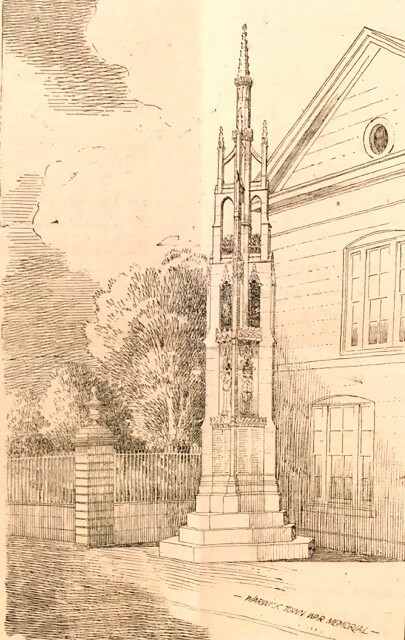 The design, by C. E. Bateman F.R.I.B.A., is a three-stepped octagonal base surmounted by the Eleanor Cross, with bronze plaques on lower levels displaying the names of the fallen. There are carved archways on many of the stone levels. The cross is topped with decorative finials. Above niches on each side are carved shields with the Arms of Warwick, Leamington, Coventry, Stratford-upon-Avon, Kenilworth, Rugby, Birmingham and Sutton Coldfield. 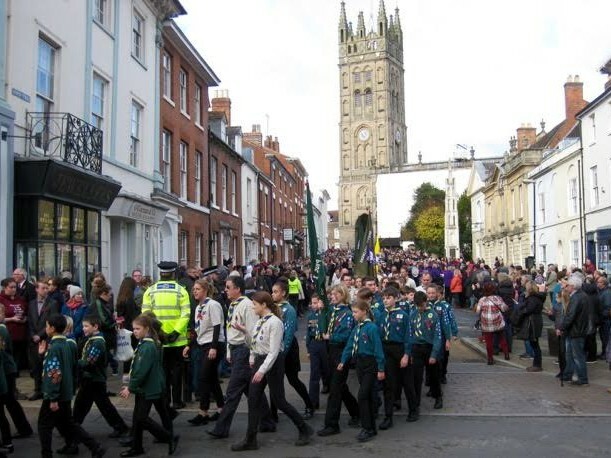 Above the shields are carvings of the symbols of the County of Warwickshire: The Swan of Avon, the Dun Cow, the Bear and Ragged Staff, and the Antelope, emblem of the Royal Warwickshire Regiment. 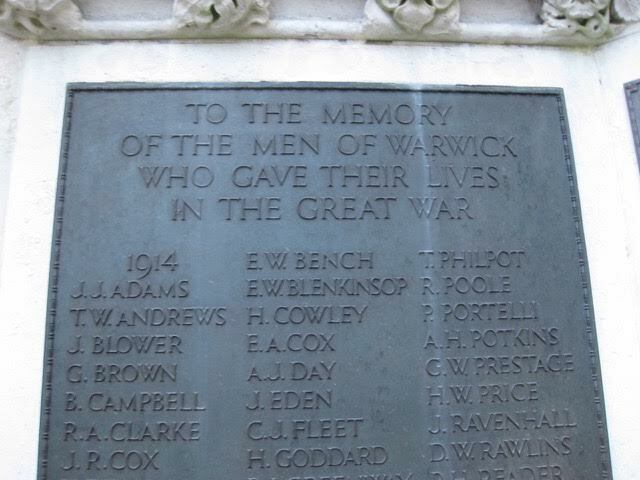 The main inscription reads, ‘To the memory of the men of Warwick who gave their lives in the Great War’. 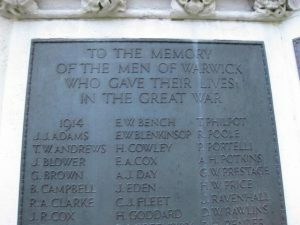 Bronze plaques lists the names; some extra plaques have been added over the years as more Warwick victims of the war came to light, including a plaque added in 2015 with six names identified by researcher Christine Shaw of Unlocking Warwick. 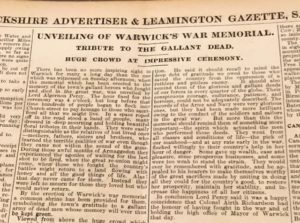 The Warwick War Memorial was unveiled on 10th July 1921 in the presence of Lord Algernon Percy, High Sheriff of Warwickshire, honouring the 358 men and 1 woman from Warwick who died in the so-called ‘Great War’. 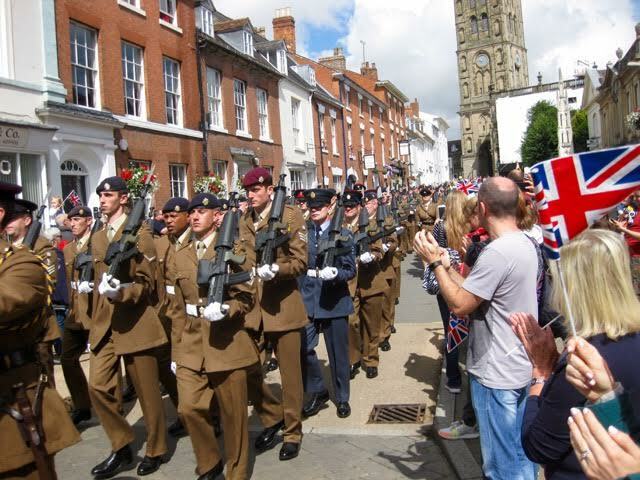 The Warwickshire Advertiser reported that there was “a huge crowd at the impressive ceremony….quite 5,000 people. There has been no more inspiring sight in Warwick for many a long day.” Many of the relatives brought floral tributes that were heaped at the memorial. 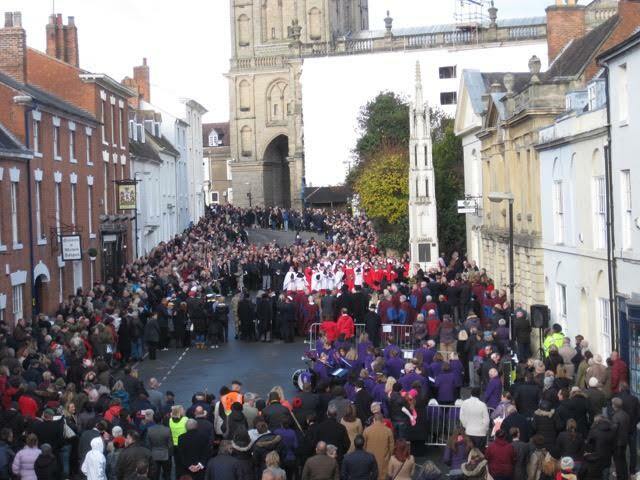 The choir of St. Mary’s emerged from the church singing, ‘Brief life is here our portion’. 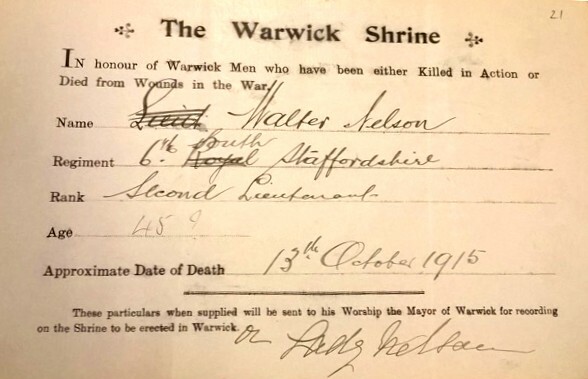 The report continues, “The formal presentation of the memorial to the town was made by Lord Percy who requested the mayor to take it into the safe custody of the corporation. He said it should call to mind the deep debt of gratitude we owed to those who saved the country from the oppression of a ruthless and pitiless enemy. They would ever be remembered with gratitude”. 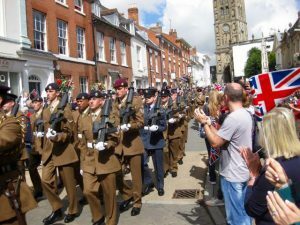 After the Second World War (1939-45) a plaque was added to honour the 99 service personnel from Warwick who gave their lives in that conflict. The Warwick War Memorial is the focus of Warwick’s annual Remembrance Parade and Service in November, as well as for Holocaust Remembrance Day in January, and events honouring local military units such as the Kineton Freedom parade. The tall, slim spire of white stone with its fine carvings is regarded as one of the most elegant war memorials in the UK. The memorial was designed by C.E.Bateman of the Royal Institute of British Architects. 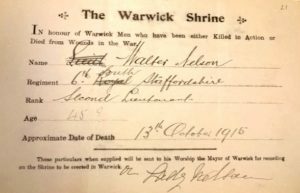 Families were asked to submit a form for a name to be included on the memorial. This one is for Walter Nelson, the Director of the Nelson Dale Co. 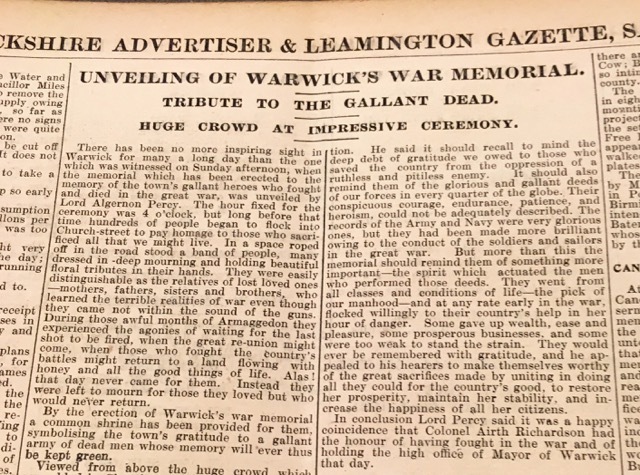 The Warwickshire Advertiser reported a crowd of 5,000 people at the unveiling in 1921.